Use this guide to choose the best sofa bed for your home – we take a look at both construction types and quality checking, mattress materials and fabric types. For still more information, check out our guide to choosing a sofa. What to consider when choosing a sofa bed? Similarly to when you’re choosing a sofa or armchair, you’ll need to consider how your sofa bed will be used – is it adults-only seating or do you need to take into account the tough time kids and/or four-legged members of the household might give it, too? Will it be used for seating daily or every now and then? Upholstered seating needs to be well constructed to stand up to daily use, and the fabric and fillings you choose will not only affect comfort and how the sofa bed looks, but its longevity and ease of cleaning, too. Be aware that the bed element of sofa beds varies enormously in terms of comfort and support. Some are fine for occasional overnighters only, while others offer bed-like comfort and are made to cope with frequent use. Whether you’re sleeping singles or a couple will also influence your choice of the size of the mattress, too. Remember that a large sofa bed doesn't necessarily equate to a large sleeping area. Check out how easy it is to get the bed out as well. If last-minute guests and late night conversions from living room to bedroom are the norm, struggling with an awkward mechanism won’t be welcome. Which type of sofa bed? You’ll need to decide between a fold-out or pull-out sofa bed. Beds that fold out flat tend to have a larger sleeping area but will not have a headboard. You might also like to add a mattress protector beneath the bedding, both to soften the seating/mattress and to protect it from spills. Pull-out sofa beds usually have two or three-fold mattresses: those that fold twice should be deeper and more comfortable than mattresses that fold into three, which are generally thinner and less supportive. However, these sofa beds are often more affordable and may be all you need for occasional guests. Choose an ottoman sofa bed which will blend into your home seamlessly. Budget sofa beds can suit agile guests for occasional sleepovers, but the experience won’t feel the same as a night in a bed. Some designs have a foam mattress that folds out on to the floor with the back of the sofa as a headboard. Cost-conscious designs are also available as simple cube seats (single or double), or space-saving armless sofas. 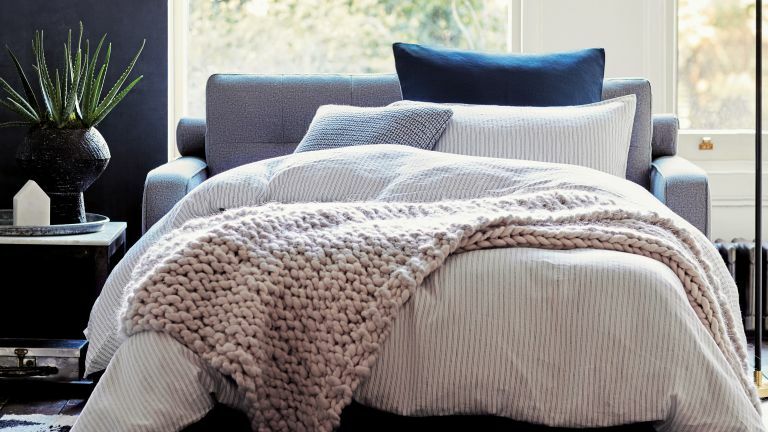 Browse our pick of the best sofa beds under £500 if you're serious about bagging a bargain. Looking for a bargain? We're constantly scouring the internet for the best cheap sofa bed deals – find out what's on offer at the moment. Mattresses may be open or pocket sprung, or made from memory foam. Memory foam moulds to the body to create good support, but some people find it too warm. Pocket springs are more luxurious than open springs – and more costly – and can help stop sleepers rolling together, so think about guests’ needs and your budget when choosing. Sofa beds come in a range of sizes – from footstool and armchair beds through to love seats and small sofa beds to medium, large and corner versions. Start by checking the measurements of the sofa bed carefully to ensure it will fit the room when it’s fully open. It’s the measurement from the back of the sofa to the end of the sleeping area you need, not just the bed’s dimensions. Check out the size of the mattress, too, rather than judging sleep space by whether the sofa’s a two or three-seater. As we've said, a big sofa bed doesn’t necessarily equate to a large bed. Bear in mind, too, that a small double mattress might be perfectly fine for a single sleeper but a couple may not get a good night’s kip on one. Need to sleep a couple for more than a night regularly? If you can accommodate it, a sofa bed that provides a king-size sleeping space leads to a better quality of sleep for two people. Just as when you buy an armchair or sofa, the upholstery of a sofa bed needs to stand up to the treatment it’s going to receive and not just look good when it’s new. Choose your sofa fabric carefully – our upholstery guide offers handy tips. Look at the rub count – at least 10,000 rubs is acceptable for domestic upholstery; many offer 20,000 upwards, and at least 30,000 is great for a high use piece of furniture in a home with children and/or pets. Removable, washable covers are a bonus, too. For longevity, look for tightly woven fabric, a high thread count and a woven, not printed, pattern. A protective finish might be well worthwhile – especially if you’re kind enough to bring overnight guests a cuppa in bed. Look out, too, for fabrics with an Aquaclean coating built in as they can be cleaned with water. Sofa beds are made with the same fillings as sofas. Choose foam for a firmer seat; fibre for softness with support; or opt for plump feathers for the softest sofa. Fillings may also be combined for a balance of features. Do bear in mind, though, that a sofa bed will feel firmer than a standard sofa, so try in store or shop with an online company that allows returns to ensure you’re happy to take a seat as well as put up visitors. Read our guide to buying a sofa or armchair to get the full low down. Sofa beds come in both contemporary and traditional styles, so you needn’t be forced into a style choice you wouldn’t normally make in your search for a two-in-one piece of furniture. Long, low lines will create a modern vibe, while high-backed designs look more classic. If you’re buying a sofa bed for a small living room, as well as overall dimensions, bear in mind arm shape – which can be space-hogging or saving – and whether the sofa sits on the floor or is raised on show-legs. The latter can help a small room feel bigger. Want more living room furniture inspiration?